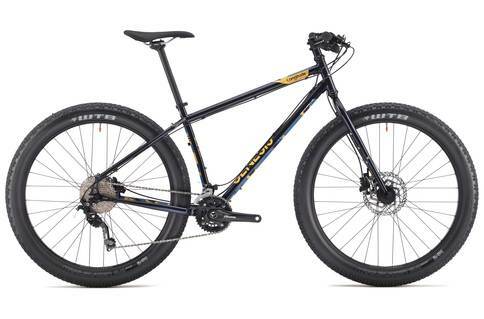 Click the button below to add the Genesis Longitude 2017 Mountain Bike to your wish list. A mid-fat, expedition ready, fully rigid adventure machine!A dedicated 27.5+ platform comes a whole host of benefits; same air volume as the 29+ setup but in a lighter, faster accelerating, more manoeuvrable package that will fit a wider range of folk, especially at the smaller end of the size spectrum, without sacrificing geometry or standover. The rugged Shimano Deore 2x10 drivetrain will take you, fully laden to the furthest flung corners of the world and the efficient, fast-rolling 2.8" WTB Trailblazer's are tubeless-ready and ripe for the upgrade. With no-stone-left-unturned Genesis have even bundled the bike with a couple of Free Parable's excellent Gorilla cages - allowing you to carry pretty much anything (1.5kg limit) that'll fit into their hugely adjustable cradle.